One of the biggest perks of living in Hawaii is that the ocean's surface water temperature is typically 77-83°F, which lends itself perfectly to snorkeling explorations any time of year. 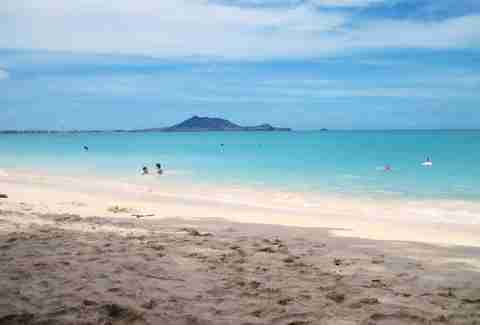 Your best bets in Oahu are to venture outside of Honolulu, as these snorkeling sites tend to have more sea life hanging around, and are less crazy-busy on the beach. And remember, safety first, so if you go snorkeling, bring a friend, and be aware of any potential ocean currents -- when in doubt, ask a lifeguard. 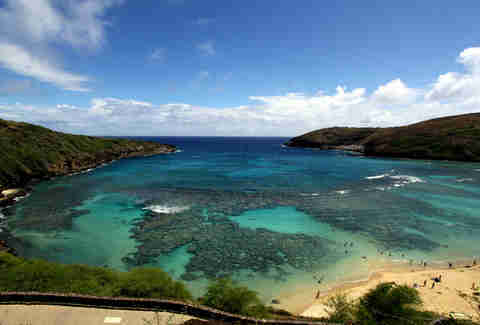 Hanauma Bay, a protected marine life conservation area located on the east side of Oahu, is managed by the State of Hawaii. There's a park entry fee of $7.50 for visitors; however, it's free for residents, military personnel, and children under 12. A mandatory video provides safety and educational information prior to accessing the beach, but it's pretty simple: don’t step on the coral and don’t feed the fish. This is a great spot for new snorkelers, as there are tons of ocean creatures to run into without having to swim out too far. You can see the State fish -- Humu humu nuku nuku apua'a -- as well as sturgeon, wrasse, and parrot fishes, among many others. Have patience and look closely inside the crevices in the coral, as there could be an octopus or eel hiding inside. Baby Makapu'u is located on the Waimanalo side of Makapu'u Beach Park, on the east side of the island. 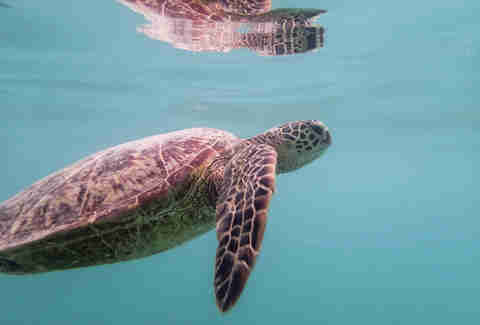 Mostly visited by locals, it's known as a surfing spot, but it's a great place to snorkel with turtles. Since it's not an overly packed beach, it really feels like you've entered the turtles' world. And if you're a shell collector, there are plenty of cone shells for the picking. Watch out for shells with living animals inside, though -- they may seem harmless, but their poisonous dart is no joke. There’s a really nice sandy beach area, and as a bonus, you can walk along the beach and go under the Makai Research Pier, which is a spectacular place for photos. Probably one of the more well-known snorkeling spots on the North Shore, Shark's Cove has the distinguishing feature of some interesting underwater rock formations and schools of needlefish and mullet that swarm close to shore. It's better to explore this area during the summer months, as the winter swell often brings large waves into the bay. The variety of fish is similar to Hanauma Bay, but feels less regulated, since there's no fee to pay and no video to watch… just gather your courage and jump off the rocks into the ocean. Check out Pupukea Grill, a food truck across the street, which makes a kalua pig quesadilla that is so completely satisfying after a long day in the sun and exploring the salty sea. If you're looking for a place to snorkel that's in town, relatively safe, and easy to access, Sans Souci Beach is exactly right. 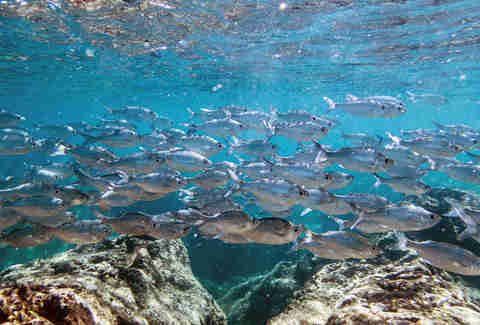 When the tide is high enough, swim over the shallow, flat reef to check out the fish and coral. You can also follow the rock wall on the left side of the beach to view more fish, but be careful -- the current is strong in this channel. 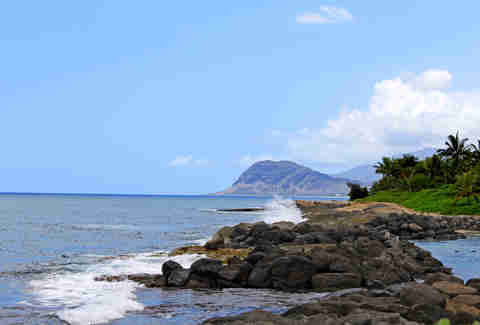 Kahe Point Beach, aka Electric Beach, is named after its proximity to the electric power plant that pipes warm water into the ocean. Luckily for snorkel and scuba enthusiasts, the water from these pipes attracts a plethora of undersea animals. There’s a small parking lot by the beach that sometimes fills up, so cars often park along the roadside near the train tracks. The beach itself isn't one to lay out on -- it's pretty tiny -- but if you’re there just to get in the water, it's perfect. There aren't any lifeguards here, so it's really only a good fit for strong swimmers with lots of experience. Swim along on top of the pipes, and the crystal-clear water makes for fantastic viewing; you'll definitely be able to check out coral and fish, and sometimes spinner dolphins, turtles, and monk seals make an appearance, too. Be careful not to swim directly in the path of the mouth of the pipes, as the current is extremely strong and can send people out into the ocean in a manner of seconds… but if you stick to swimming above and next to the pipes, you'll be fine. 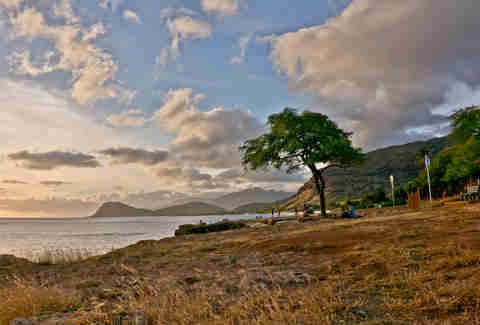 It's a far drive out to the west side, but totally worth it -- the drive along the Waianae coast is scenic and beautiful. 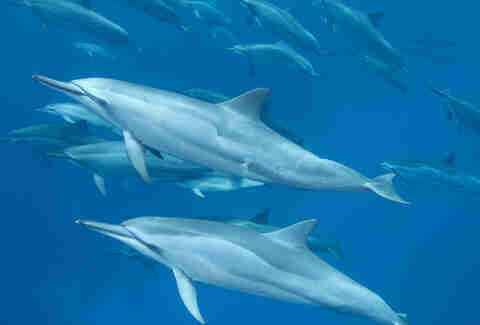 Makua Beach is home to a pod of spinner dolphins that often hang out in the early morning hours. This beach isn't too heavily populated, so it’s definitely a place where you can just enjoy relaxing undisturbed. The four lagoons at Ko Olina are perfect places for spending the day with friends. The lagoons themselves are protected, fairly calm, and a great place for beginning swimmers. One of the downsides of these man-made lagoons is that there are no coral formations, but a major plus is that there are tons of fish that swim through here, including butterfly, goat, Moorish idol, tang, and wrasse. If you aren’t staying at the resorts, there's limited public parking at each of the lagoons, with Lagoon No. 4 having the most number of spaces available. If you can’t make it out there early to avoid the crowds, just head to the No. 4 area and take a short walk along the connecting path. Each of the lagoons is pretty similar and has comparable snorkeling opportunities, so pick the least crowded one and have fun! Amanda Zen is a freelance writer for Thrillist whose inner mermaid comes out every time she goes snorkeling.